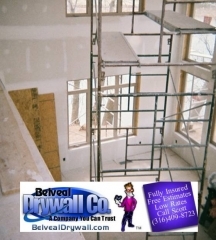 Belveal Drywall specializes in complex, challenging Drywall & Ceiling construction projects. Belveal Drywall also will do Acoustical Spraying, Custom Knock Down ceilings/walls, and of course The Unique Stomp ceilng. In the past we have sheetrocked, finished, and sprayed an impressive variety of construction projects ranging from rental apartments, to Motel 8's,and to nursing homes. 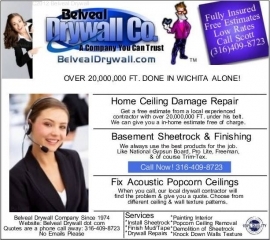 Belveal Drywall has been here since 1974 and and has got awards for customer satisfaction!